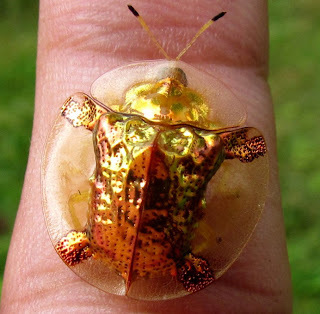 The golden tortoise beetle is a common North American beetles that lives on and eats morning glory leaves. They can also be found on sweet potatoes which belong to the morning glory family. Both larvae and adults feed on foliage of which they make many small- to medium-sized irregular holes. Rarely are tortoise beetles numerous enough to be considered damaging to the host plants. 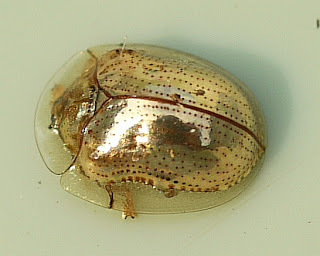 In spring and summer, the beetle earns its name by turning the color of brilliant liquid gold. The color is produced by an optical illusion—the outer cuticle is transparent and reflects light through a layer of liquid over the next layer of cuticle. The beetles change color depending on the availability of the liquid layer which they control through microscopic valves under their shell. In the fall and winter, the beetles become less lustrous and are more orange and bronze often with black spots similar in appearance to ladybugs. If you try and add the beetle to an insect collection, it quickly turns dark brown as is dries, and looses its golden color. The beetle is most beautiful while alive. The larvae hatch out in late May and June and are just as interesting as the adults, but in a much different way. The young larvae are surrounded by many small protuberances giving them a spiny appearance. As the larvae molts, it keeps its old skin attached to a fork-like structure hinged to its rear end. The larvae will add its own feces to the old shell to create a type of shield which it can use for defense. When they are disturbed by another insect or predator, they flip the shield up in the direction of the disturbance. This "poo protector" is an unappetizing and effective deterrent against potential predators looking for a meal!